We all need to pay attention when cooking to prevent fires. According to the United States Fire Administration (USFA), a branch of the Department of Homeland Security, your risk of death from fire increases significantly as you get older. In fact, the organization states that 1,100 Americans ages 65 and older die each year as the result of a home fire. Additionally, when compared to the rest of the U.S. population, people ages 65 to 74 are almost twice as likely to die in a fire, people between the ages of 75 and 84 are almost four times as likely, and people age 85 and older are more than five times as likely. As a result of these frightening statistics, the USFA has started a fire safety campaign aimed at citizens ages 50 an over with the goal of helping them decrease the risk of unintentional death by fire. The focus of the program is to educate seniors on home fire safety. Below are just some of the tips they have published on their website. The USFA strongly warns against smoking in your home, as careless smoking is the leading cause of fire deaths nationwide. Unfortunately, if you fall asleep while smoking, you run the risk of setting your clothes, rugs, or furniture on fire. If you must smoke inside your home, never smoke in bed, fully snuff out what you are smoking at the first sign of drowsiness, and never walk away from a lit cigarette or cigar. Cooking fires are the leading cause of injury among people ages 65 and over. Around hot equipment, serious fires can start in a heartbeat. 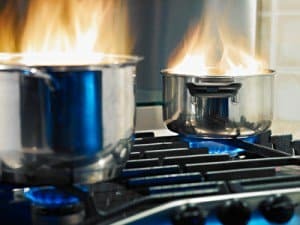 You should take care never to wear loose clothing when cooking, not to leave any cooking pots on your stovetop unattended, and never leave anything flammable, such as paper towels or potholders, near your burners. Another good practice is to double check your kitchen appliances each night before bed to make sure they are fully turned off. You should also plan to replace each smoke alarm if it is 10 years or older in age.